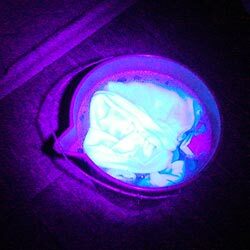 Black Light - What is it? In This Page I will endeavour to give as much information on the subject of Ultra Violet black light products, their uses in home and industry, and how they are different from Glow in the Dark Products. If you have been to a night club, you would have seen UV Black Lights at work. The white clothing on some individuals that seemed to glow in the dark, were reacting to the night clubs black lights. Nature has created things that naturally Fluoresce. Examples are, Rocks, and Minerals.. These organic and inorganic forms, naturally fluoresce, but their true beauty can not be seen in darkness, by the human eye unless we use a object like a UV Black Light Torch. When we wash our clothes, use washing powder, or liquid, with optical brighteners included, these helps to make our white clothing appear whiter, and our colours look brighter. 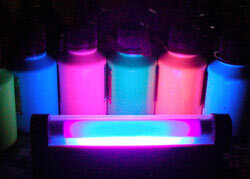 The image above shows Special UV Glowing Paints Fluorescing because they are exposed to the UV Black Light situated at the bottom middle of the image. 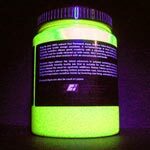 UV Black Light Products have a consistent glow, but glow in the dark products start off with a strong glow effect and their glow intensity deminishes over time. UV Black Light Products need a UV black light source to fluoresce - glow. Glow in the dark products do not. 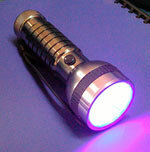 UV Black Light products are generally cheaper to purchase. UV Black Light colours may be mixed together to create new colours, where as glow in the dark products, should not be mixed due to the fact that the resulting colour glow will have inferior glow properties. Copyright © 2009 - 2014 [Glow Paint Industries]. All rights reserved.